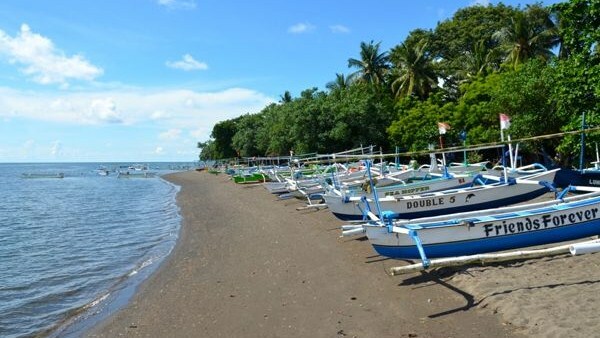 Lovina Beach includes coastal tourism in North Bali. Precisely 10 km to the west of Singaraja. 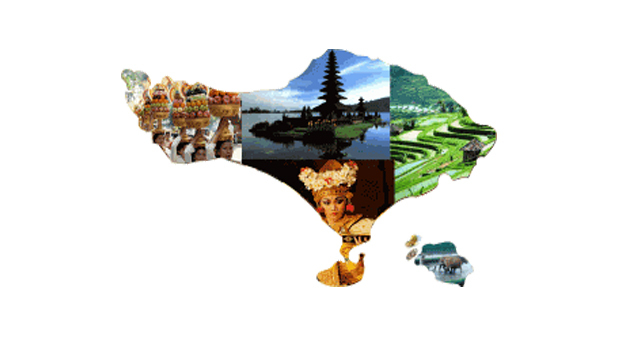 It's location in the village of Kalibukbuk, Buleleng, Bali. Therefore it is better known as a tourist attraction Kalibukbuk. In Lovina area, there are many lodging at varying prices. Ranging from simple inns to luxury accommodation. There is also a specialty that provides dolphin attraction - dolphins have been trained and a small zoo at the inn. Lovina Beach has black sand and the location is still very natural. In the area of coast lined seen many traditional fishing boats. But the main attraction of the beach Lovina is not on the coast, but on the activity to see dolphins in the sea. 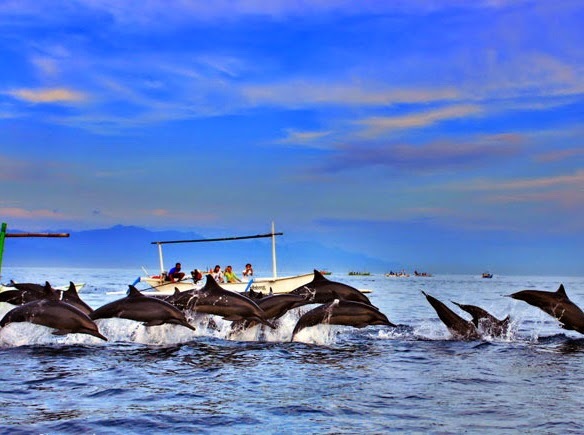 Regional attractions Lovina is very popular with dolphin shows - wild dolphins in the sea. On the beach, there are hundreds of dolphins. To be able to see dolphins in action, you have to go to sea before sunrise. The Dolphins will appear in the middle of the ocean between the hours of 6 to 8 am. Journey to the sea in waters heavily favored Lovina travelers. Lovina marine waters are relatively calm so it can be passed comfortably using fishing boats.You can see dolphins around 1 km from the coastline. There is skipped to the surface, and there is also a swim. The action is very interesting marine animals black on this one. Tourists visiting the traditional fishing boats can be rented exclusively reserved for tours to see dolphins in the sea. As he headed to the sea to watch the dolphin show, you can watch the beautiful ocean waters and natural Lovina. The duration of the activity to see dolphins in Lovina about 2 hours. Fishermen will take you to the sea with traditional boats, where dolphins often sprung. Besides being able to watch the dolphin show, Lovina Beach is also available diving. Biodata in Lovina diverse marine species and is not inferior to the dive sites in Bali else. 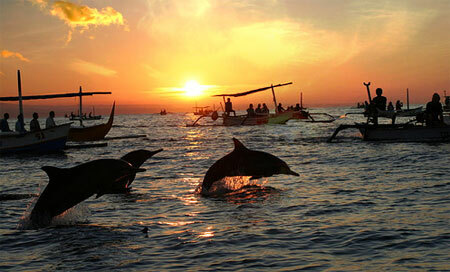 Are you interested to see dolphins in the sea while on vacation to the tourist attractions Lovina? 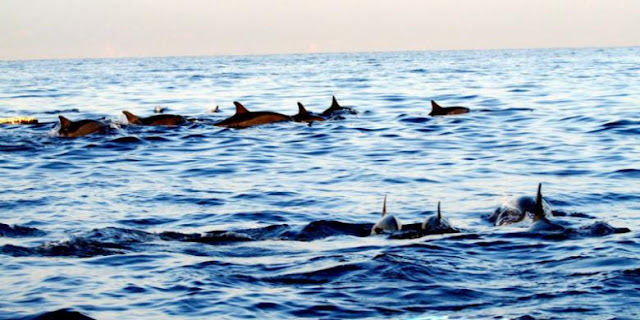 If you answered Yes, definitely want to know about the price to see the dolphins at Lovina. To see dolphins in the sea coast Lovina is not charged. So if you ask about tickets Lovina Dolphin dolphins in the ocean, the answer is no. Taking the cost of hiring a fishing boat to go to sea, the location of dolphins. Boat rental rates in Singaraja Lovina beach to see dolphins out at sea, around Rp 150,000 / person. - The duration of the rental boat about 2 hours. - Boat capacity of 5 people. - Breakfast in the morning when you're done watching dolphins in the sea. - If no price can be cheaper breakfast, Rp 110,000 / person. The best time to see the dolphins from the hours 06: 00-07: 30. So, you have to be at the beach location about an hour later at 5:30. Price watch dolphins in the ocean do not include the cost of transportation to attractions Lovina Buleleng Bali.